The evening of Holocaust Day. One of the few occasions when Tel Aviv takes on a more serious look. People withdraw from entertainment. TV broadcasts exclusively stories of the Holocaust, sad movies, and sad songs. However, many Israelis complain that even here, in this country made up of Holocaust survivors, even here the Holocaust is becoming distant. As if the ceremonies and the established tone of the commemoration, while trying to preserve the memory, actually acts as a distancing mechanism for the collective immaginarium of what happened. If you can call it a story, it is already mythological. Less real. It has to have a face. It has to have a voice. 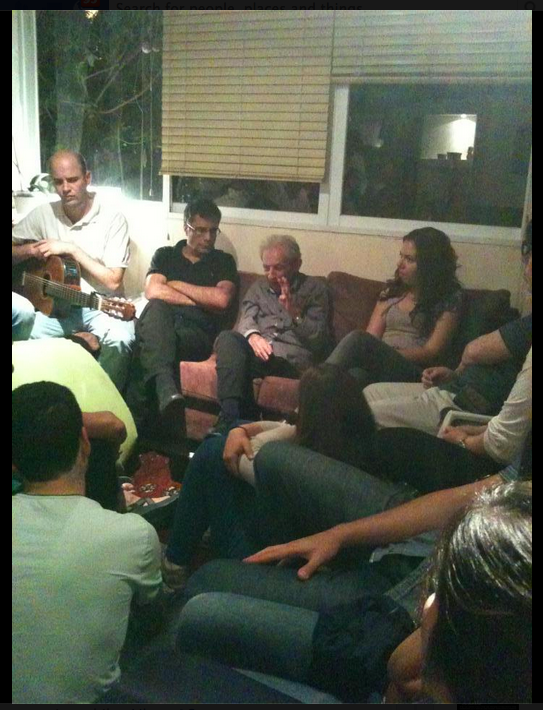 Then a few young people had an idea: to bring together Israelis and a survivor of the Shoa in an informal setting, which is simply put, somebody’s living room. They called the initiative “Memories in the living room” (Zikaron baSalon, http://zikaronbasalon.wix.com/memorieslivingroom). The first year they had only one or two meetings organized. Last year more volunteered to open their private space. This year, a more established network of volunteers made many more encounters possible. So when a friend posted an invitation about such an evening, I went. Twenty, thirty people quickly assembled in her cozy telavivian apartment, sitting on every available surface. Most of them young. They gathered to meet a special guest, a Holocaust survivor. By 8 pm Yossi arrives. He enters the room with trembling legs. A small man, almost swallowed by his shirt and black trousers. He sits down on a sofa. His eyes are watery. His downcast look seems to want to focus for a moment. Where to start? From the beginning… He was born in 1927 in Yugoslavia, in a Serbian town called Sambor. At 17 he was rounded up, together with all his family, and transferred to the camps. He changed many sections, camp 3, camp 7, camp 4… then Dacau. Yossi is surrounded by a respectful silence while he recalls his life in these exceptionally brutal circumstances. I keep thinking that he is so small, I am afraid he will disappear before finishing his story. Shrinking, just like the number of survivors who are still alive to tell. It is not easy to follow the unfolding of his story. My Hebrew is not so good, plus he talks like old people do: in meanders, with an order which is more like a mental anchor than a chronology. Nonetheless, when it comes to the camps, he remembers exact dates. He remembers the length (in meters) of the stable where they kept him. He remembers when food ran out. He remembers the endless jobs he was assigned to do. He even laughs when he remembers the series of incredible coincidences that allowed him to survive. An example. When he was about to be burned alive, together with a group of Typhoid patients amassed in a barn, he heard the guards speaking Serbo-Croat, his own language. Somehow he talked them into sparing him, saying that he will help after the war, and that the war was almost over. “Not all of them were cruel“, remembers Yossi. “Sometimes they even let us rest, during the daily ten hours shift“. I guess that accounts for niceness, given the circumstances. After the liberation of the camps, Yossi went back to Sambor. But he was alone. He somehow made his way first to Belgrad, and then in Zagreb (“but I did not like the Croats“, he recalls). He studied at a technical institute. Then in 1949 he boarded a boat to Israel, where he has lived ever since. On the boat, they asked him what his name was: Yossi, Yossi Hai. For a misspelling error, they ended up writing his name Chai, which in Hebrew stem from the verb “to live”. So his name became Yossi Lives, which is quite sensational if you think about it. Yossi married and today he has a daughter, and three nephews. He lives in Ramat Gan, few kilometers from Tel Aviv. When they ask him if he is happy with the treatment he receives from the state of Israel, he says it is all right. “Every year they take us to a sponsored trip. Although every year, the trip becomes one day shorter”. ps. On November 12th, The Foundation for the Benefit of Holocaust Victims in Israel announced that it had temporarily run out of funds, due to inadequate allocations in the budget. pps. As I was about to finish this post at 10 am, a siren went off. Since yesterday a new rocket was fired from Gaza (it actually interrupted a Holocaust ceremony in the southern town of Sderot), I instinctively got up to go to the shelter. Then I remembered: the siren to commemorate the Holocaust is the exact same one that is used for warning against incoming rockets. So the following, unlikely thought, formed in my head: no panic, it is “just” the Holocaust.